Structural rot: Evidence of at least a third roof on the flat area around the chimney structure. We found two sets of flashing around the chimey, and two roofs on the flat. With roofs more is not alwyays better, with each roof application the quality of work is typically diminished. It may take longer for the water to enter initially, but the compounded damage caused, does not make for a reasonable risk. With suffic ient nailers added, piecing the new wood is acceptable, when not a weight bearing wall. 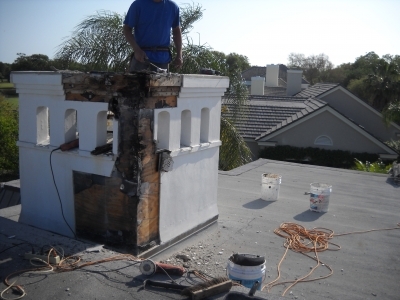 What is not acceptable is to abutt the felt, wire and the stucco, this is SOP (Standard Operating Procedure) by all companiies with whom we have seen stucco repairs completed. 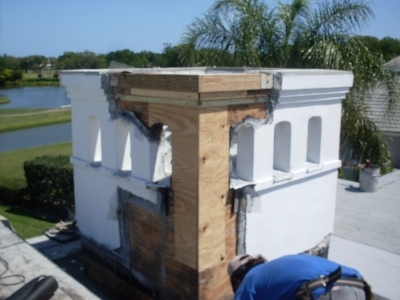 Proper procedure is to chip the stucco from the saw cut side of the existing stucco. The old stucco must be chipped back irregularly 4 to 6 inches. At least 2" of the wire must be cleaned, this is to allow the new felt to be tucked under the old wire, and the new wire to be overlapped at least 2". This is the result when the new stucco base and stucco is abutted, to the old. Typically those who do not know better, or maybe they just don't care, apply a big fat, or maybe a little thin bead of caulk from the old to new stucco. 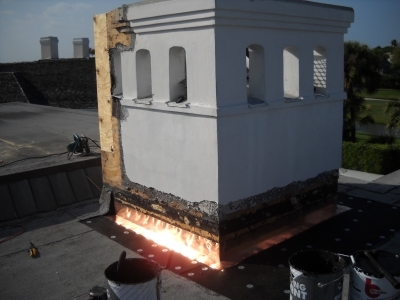 If you want to save some money and let caulk bridge this marriage through the brutal summers here in Florida, then you do not need to worry who eliminates your chimney problem, there is a long list of people who will take your money, some are even unlicensed. Give us a call, let us take you step by step through the right way to eliminate your problem the first time!